The Oak Ridge Free Air CO2 Enrichment (FACE) experiments let scientists examine how trees respond to elevated levels of carbon dioxide. Photo by Jeffrey Warren, Oak Ridge National Laboratory. Carbon is the chemical foundation of all living things. Animals consume carbon indirectly – either by eating other animals or by eating plants. However, plants absorb carbon (in the form of carbon dioxide, or CO2), directly from the air. Several studies have examined how increased CO2 affects tree leaves and wood, but Eberhardt and his colleagues studied the effects on sweetgum bark. Their study was recently published in the journal Trees. 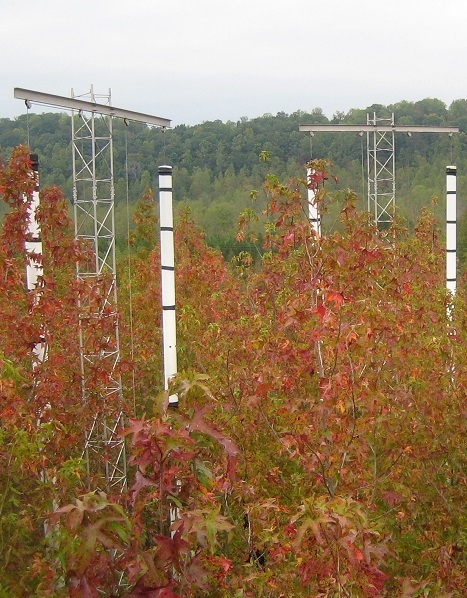 Eberhardt studied sweetgum on a plantation established in 1988 in eastern Tennessee as part of the Oak Ridge National Laboratory Free-Air CO2 Enrichment experiment. Since 1998, towering rings of white plastic tubes pumped extra carbon dioxide into two of the five study sites. In 2009, after 12 years of treatment, 10 trees were harvested. Eberhardt and his colleagues separated the inner and outer bark for analysis. The scientists measured the amount of trace metals; extractives, which are organic compounds that dissolve in water or other liquids; main structural components such as lignin; and ash content, which describes how much of the bark’s dry weight is from inorganic compounds. Sweetgum trees grown in elevated CO2 had a number of changes in the chemistry of their inner and outer barks. The ash content in their inner bark was 33 percent higher than ash content of trees grown under ambient CO2 concentrations. “The biological and ecological consequences of such a dramatic increase are not known,” says Eberhardt. “However, increases in ash content tend to make it harder to use wood for producing bioenergy, lumber, paper, and other items.” The inner bark also had more extractives and higher amounts of trace metals, especially manganese. Researchers also saw changes in the outer bark, which had lower levels of nitrogen. For more information, email Thomas Eberhardt at teberhardt@fs.fed.us. Read about the Free Air CO2 Enrichment experiment at Oak Ridge.